There was once a child who, having no father and mother, lived alone with a Giant in the middle of a deep forest. Things had been like this as long as the child could remember and, as he himself was always quite happy, he never stopped to inquire how they came to be so. How did the Giant live? Every night when the child was asleep, he used to creep out to the nearest town where he would catch a man or woman and eat them up. This is the way he kept himself alive—and it is perfectly true, although he never told the child anything about it. 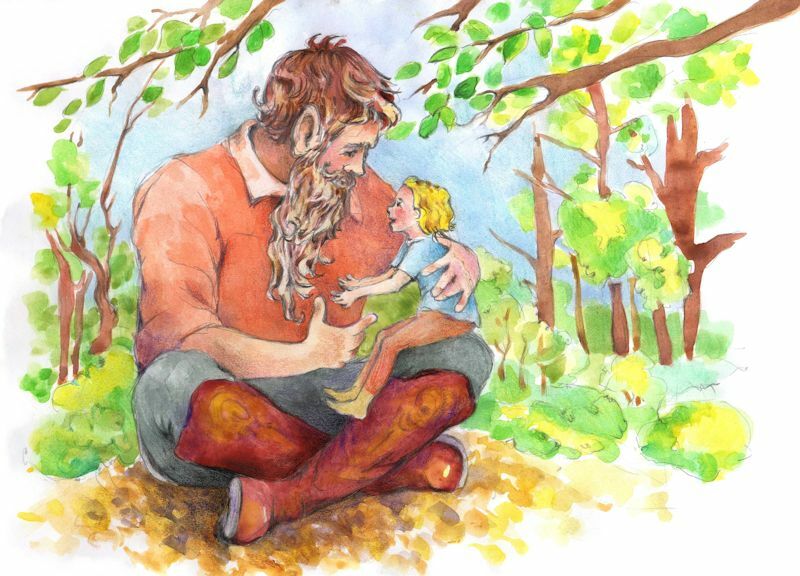 “A man,” replied the Giant quickly, feeling that he had made a mistake, “is—well it is a thing of no importance.” And as he spoke, he looked sharply at the child. There was no denying it, the child was growing bigger! Now it had never occurred to the Giant before that such a thing as this could happen for, in spite of his enormous size, he was as stupid as an old sheep. Finding the beasts and birds all too clever for him, he had stolen the child from its father and mother some years ago to be a companion to him. And now, thought the Giant, the child will grow up and get clever like the rest, and then I shall have no one to play with. What am I to do? And his great eyes filled with tears. For, in spite of his cruelty, he was a great baby at heart and liked playing childish games. 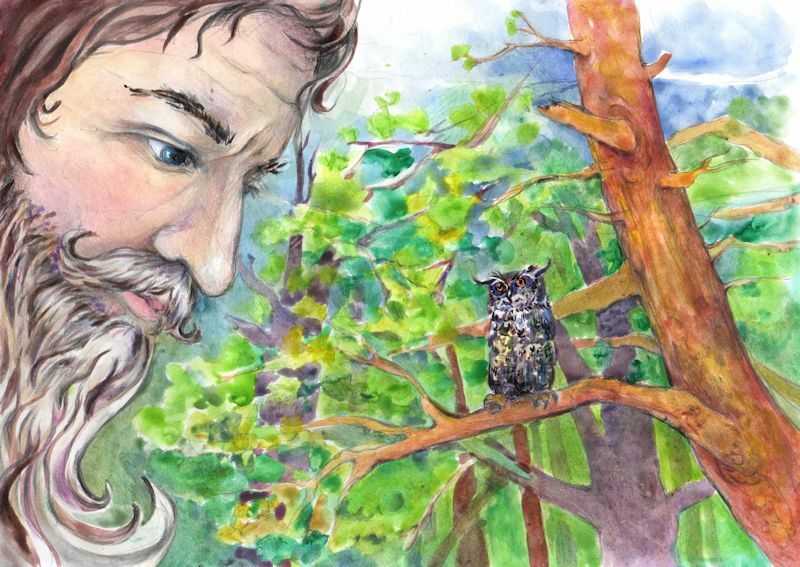 At last he remembered how he had heard that the Owl was the wisest of all birds, and resolved accordingly to ask its advice, for the Giant could understand the language of birds and beasts, though the child could not. He went to the Owl, whom he found sitting perfectly still on the branch of a big oak-tree. “How can I stop the child growing up and getting clever?” he asked. The Owl shifted one claw about half an inch to the right and set its head very slightly on one side. “I will tell you:” it said, “tonight, when the child is asleep, cut open your breast and take out one of your heart-strings. With this make an Aeolian Harp, by stretching it tightly between two trees. Then the child will be so enchanted with the never-ending music, which the wind will make in the harp, that he will not want to grow up. And therefore he won’t. And, besides that—” but here the Owl stopped short, thinking that perhaps after all he would not tell the Giant what else would happen if he were to make an Aeolian Harp out of his own heartstrings. But here the Owl stopped once more, thinking that perhaps after all he would not tell the Giant what else would happen if the Aeolian Harp broke. “Besides that—” said the Owl, “it’s time for me to go to sleep again. Good day to you!” And he shifted his claw half an inch to the left, set his head straight, hunched up his shoulders round his ears, winked one eye and went off to sleep with both eyes wide open. So that night the Giant did as the Owl had told him, and when the child woke in the morning he was so delighted with the never-ending music which the changing breezes made as they trembled through the Giant’s heart-string, where it hung stretched taut between two trees, that he would sit for days on end listening to the mournful and magical sound and also watching the incessant ripples on the surface of a little pool of water which had collected underneath the trees during the night. For though the wind blew sometimes stronger and sometimes weaker, blowing through the harp-string and sounding it, and though the ripples were sometimes higher and sometimes lower and the sound swelled now louder and now again more faintly, yet day and night the wind never quite dropped, and day and night therefore the ripples rippled and the string sang out. 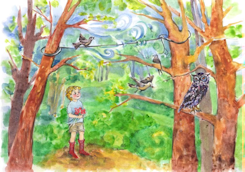 Moreover (and this was the first thing which the Owl had suddenly thought perhaps he wouldn’t tell the Giant) the effect of this wonderful new music was such that the child could now understand the language of the birds and beasts just as well as the Giant could. Here was a new source of delight. He would listen and listen and listen to all that they said to one another and was as happy as the day is long. The Giant was also very happy now that he felt he had secured his companion to himself forever. You really are the funniest fowl! They were hoping to annoy it. But the wise old bird simply sat there, taking no notice of them whatever, and the child couldn’t help thinking how strange it was that, while the swallows never left off flying to and fro from the moment they went to sleep (for their food consisted of little flies which they caught on the wing), yet the Owl spent quite a lot of time just sitting still. The child wondered what it felt like to fly. “What is that you say?” asked the Swallow flying round the child’s head as it spoke, for it could not stop flying even for a moment. “What does it feel like to fly?” asked the child again. The child saw that he would never make the Swallow understand, so he turned to the Owl. “Do you know what it feels like to fly, Owl?” he asked. “Of course,” said the Owl gravely. “Because I can sit still just as easily as I can fly,” said the Owl. “Tell me what it does feel like!” said the child. “What is your question, Owl?” asked the child. “This,” said the Owl: “What does it feel like to be a child?” The child laughed. “That’s easy!” he cried. “It feels like—it feels like—” and he tried with all his might to think of some words. “Well, it feels like being me!” he said at last. “But where shall I find the White Fairy?” inquired the child. “Follow me!” said the Owl. 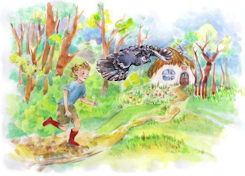 And he flew off with long slow lazy flaps of his wings, the child following behind. “And how shall I know the White Fairy, when I see her?” asked the child, as they went. But when at last they reached a large clearing in the forest, which the child had never seen before, the Owl flew on ahead. It flew on faster and faster, until before long it had left the child quite a long way behind. The last thing the child saw of the Owl was when it flapped its wings three times in a peculiar way over a little hut in the middle of the clearing—the only one the child had ever seen in the forest—before vanishing suddenly out of sight. That must be meant for a sign that the White Fairy lives there! thought the child, so when he came up to the hut, he knocked on the door. “What do you want?” cried a voice inside. It did not sound like a very beautiful voice. “You shall!” replied the voice from within, “You shall!” and with that the door opened and a dreadful old creature with a nose like a meat hook and a skin like a piece of lawyers parchment came hobbling out of the hut. 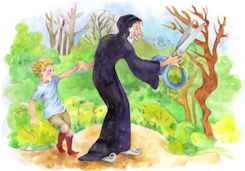 She was dressed in black from head to foot, and carried under her arm an enormous pair of shears. “Ha! ha!” she cried out, chuckling ferociously and rubbing her hands together with glee. “I’ll soon show you! Come along back, dear!” But now the poor child thought in dismay: Oh, this can’t be the White Fairy! and he tried to tell the old woman that he had changed his mind and did not really want any answer to his question now. “Nonsense!” replied the Old Woman, “a question asked is a question asked, and the sun, moon and stars together cannot unask it again. Come along with you!” And she caught the child’s wrist in her bony fingers with a grip like iron and began hurrying him along the way he had come, for although she hobbled, she moved surprisingly fast over the ground. Before long they were back at the place where the Giant lived. The Giant was away hunting food for the child. 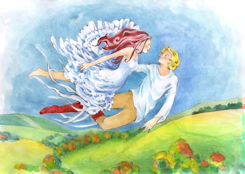 The White Fairy let go of the child’s hand and with one swift stride pounced on the harp-string which she snipped and snipped through in several places with her sharp shears. “That will teach you what you want to know, my dear!” she said, with a chuckle, and immediately hobbled off again as fast as she had come. At the same instant there was a terrible roar of pain, and then another and another, as the Giant came staggering in and fell down stone dead under one of the trees. The thread of his life had been cut with the snapping of his heart-string; and that was the second thing that the Owl had thought it better not to tell the Giant, when he had begun asking it questions. Hopeless was the desolation of the unhappy child from now on. 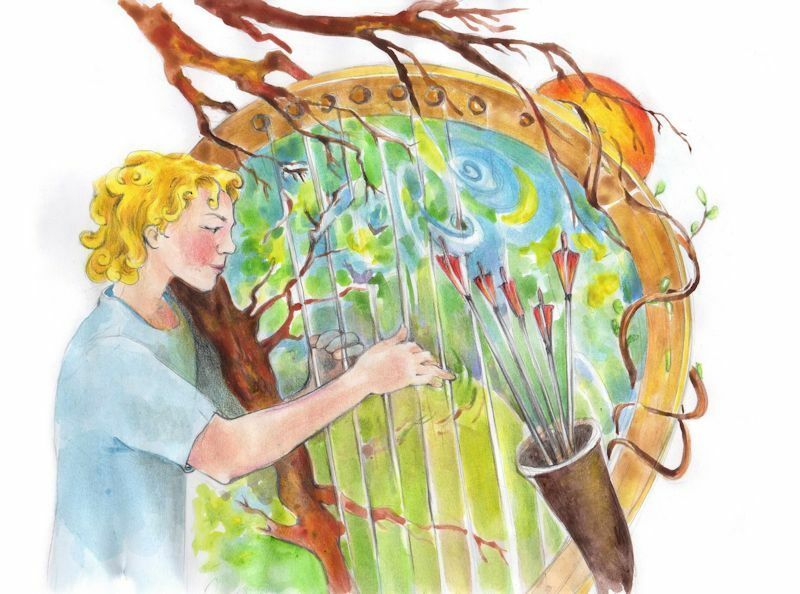 Not only was he alone in the forest with no-one to care for him, but his favourite, if not his only toy, the great Aeolian Harp, was silenced forever, and with it were silenced for him the voices of birds and beasts and insects. He could no longer understand them. Moreover with the snapping of the heart-string, the very wind dropped dead, so that there was no longer so much as a murmur from the leaves of the trees. As for the little pool, the child no longer had the heart even to look upon it. For all he knew it might be drying up altogether, for day followed day, week followed week and month followed month, without any rain falling on the forest. Meanwhile he himself moved away to another part of the forest. He felt sure he must die of hunger, for he had never before had to do anything for himself, the Giant having brought him every bite of food he could remember eating. One night, however, the thought of bones reminded him of his dear friend, the Giant, whose body he had left unburied. So the next morning he hastened back to the old spot, and there sure enough were the Giant’s huge bones all picked clean by the crows and bleached white by the sun. What surprised him still more was to see the old Owl, which had given him such bad advice, now sitting reflectively on the Giant’s skull. Full of rage the child at once grasped his bow and took aim. “Don’t shoot!” said the Owl quietly, and the child nearly dropped the bow in his astonishment. For since the breaking of the harp he had no longer been able to understand what any of the birds said. “How is it I am still able to understand you?” he asked the Owl. “Because,” said the Owl, “I happen to be the one creature left that you can understand. But do not waste time asking questions. Do what I tell you!” Now when the child remembered what had come about before from his doing what the Owl told him, he was not much inclined to obey this suggestion. But then he thought to himself: If the Owl is the only creature in the forest I can understand, I may as well do what it says. Whatever happens, I can scarcely be worse off than I am now. Besides I have a bow and arrows, and if it deceives me again, I will shoot it. 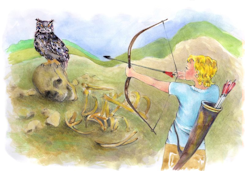 So he agreed to do what the Owl told him and the first thing was to look about on the ground among the bones and pick up the snapped pieces of harp-string. The crows, which had eaten the rest of the Giant’s heart, had found these much too dry and stringy, so they had let them lie. He found seven of them and when he had collected them together, the Owl told him to find the Giant’s breast bone. So he found this and then, with help of the wise Owl’s advice, he bored holes in it and fastened the seven broken strings, which were all of different lengths, side by side across the breast bone, stretching them good and tight. “Well?” he said, as he finished doing all this. “I leave the rest to you!” said the Owl, and it flew away. The child sat down and could not avoid thinking sorrowfully of the many happy days he had spent in the past with the great creature, whose breast bone and heart-strings were all that he now held in his hands. As he did so, his fingers began to pluck idly at the strings, and immediately, to his great surprise, there arose from them a burst of harmony so sweet, so pure, so joyful and yet, in the same breath, so unutterably sad that it thrilled him to the very marrow of his bones. 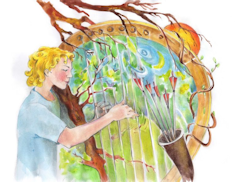 He plucked the strings again, and again there came swelling forth from them a wonderful burst of harmony—far, far more wonderful than anything the Aeolian Harp had ever given forth. For whereas that had sounded one note only, this sang many different ones, all of them mingling together in a noble union. The child sat on, plucking at the strings, like one enchanted. The Giant’s clumsy and cruel limbs might indeed be dead forever, but his childish and companionable heart seemed to live on in these waves of liquid music. By now the sun had sunk low in the sky, but there sat the child still plucking melody upon melody from the strings and weaving them together into one another with a skill that seemed to come less from his own fingers than from the strings on which they played. And though he did not at first notice it, every time he began to play, all the beasts and birds ceased from their movements, the insects were silent in the grass, and the grass itself stopped growing to listen. Even the restless swallows came and perched beside him, as if they had been swallows moulded from clay, and waited without stirring so much as a feather until his fingers should come to rest again and the music die away. But as soon as he ceased playing, the beasts all returned to their natural movements and occupations, and now each creature seemed to know what it was doing and to be speaking of it to the others. “I am eating,” murmured a gazelle contentedly. “So am I!” roared a lion. “And I am being eaten!” called out the kid, which was just then between the lion’s jaws. And, whether it were the influence of the music or simply the child’s imagination, or for some other cause, the kid positively did not seem to mind being eaten at all! The child rose to his feet and gazed into the pool of water, whose surface, unruffled by any wind, reflected his own figure back to him for the first time in his life. He saw a tall man crowned with a garland of flowers and holding in his hands a lyre. “Why, I am a man!” he exclaimed in surprise. “You are a poet!” screamed the swallows circling round his head. It was they who had crowned him with the flowers. “One and the same thing!” said a voice behind him. 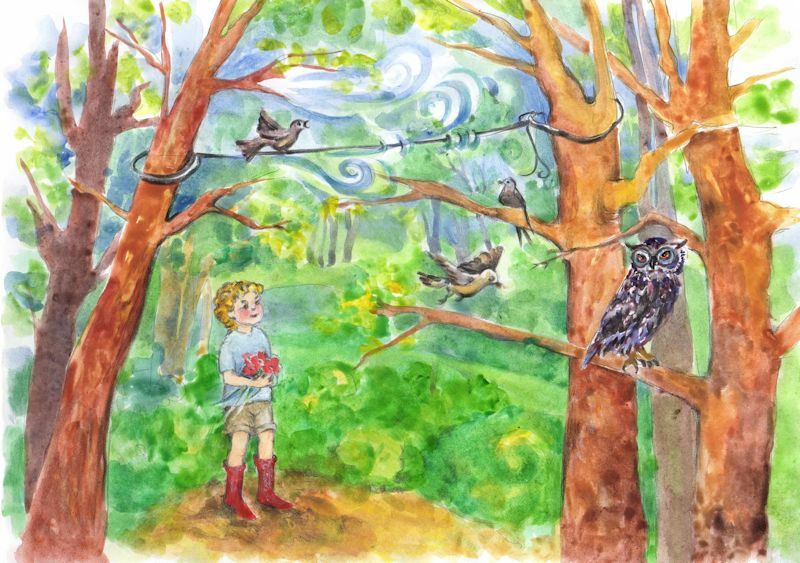 It was the Owl’s, and the child, or rather the man, wondered how it was he had never noticed before that that voice was the most beautiful voice he could possibly imagine. He turned round to speak to the Owl and saw to his surprise, not a bird standing there but a tall white being with the most beautiful face in the world. “Why did you do all this?” asked the man, greatly puzzled. 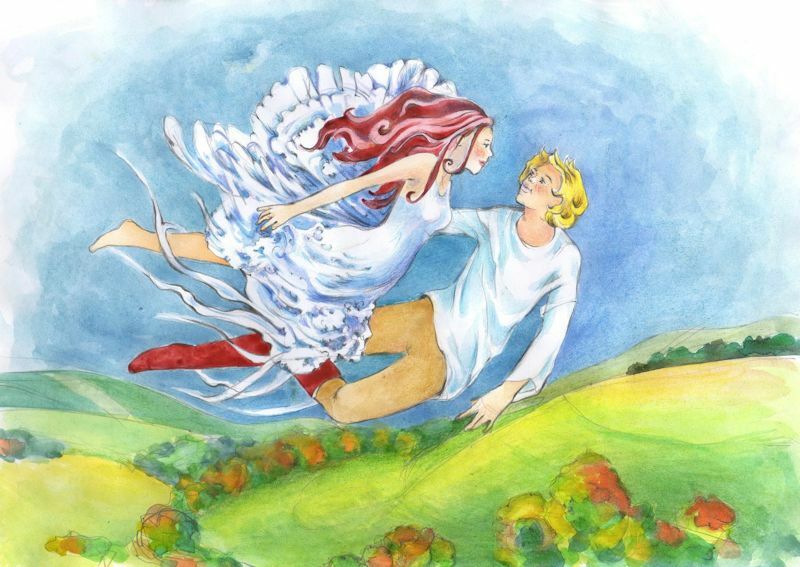 “To teach you what it feels like to fly,” said the White Fairy and, as she spoke, she spread wide her beautiful wings and caught up the man with her, so that the two of them floated high over the forest together, and there they are floating still for all I know.